There were tons of fun quilts. These are just a few that I enjoyed ~ this really cool piece was made by Shelley Jackson. It was exciting to see some that were started at classes held at our shop :) Misty Cole made the center of this one from the class we hosted with Pat Sloan last Spring. The center is Pat's Little Bird pattern, and Misty added the the amazing Leaf and outer borders of her own design! This sweet quilt was made by Wendy Allen. Heather and I both chose this one to receive our Vender's Choice award. It's sweet and happy, and Wendy's workmanship was amazing! It was a beautiful assortment of quilts! I had seen many of them before, some she has even taught at the shop, but to see them all arranged together was just amazing! Speaking of ones she's taught at our shop, her Bird Dance quilt in the show received two Vender's Choice Awards! And yet another shop quilt...My friend, and colleague, Starlyn Baker had her Baltimore Christmas Album quilt that she made as our shop sample for last year's Block of the Month in the show. And she won a Blue Ribbon and Vendor's Choice award for her Mini Nine Patch quilt. (I snapped these photos before the ribbons). And finally this is Starlyn's stunning Dresden quilt that won multiple ribbons at last year's show (this photo was taken last year). It was displayed in a place of honor on the stage this year, but the few times I had a chance to get over there and snap a photo, it was surrounded by people! 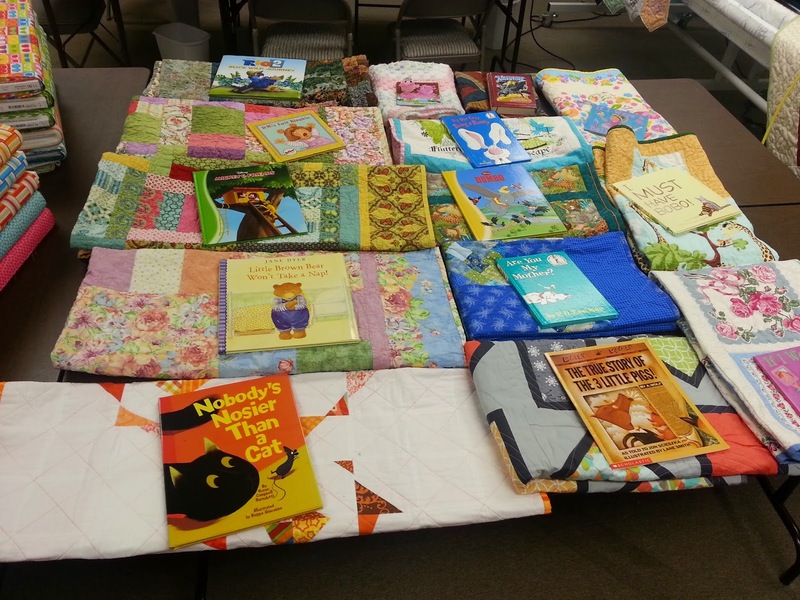 There were so many quilts at the show that were simply amazing! I'm so proud of my friends and in awe of all the quilters that gave so much of themselves to put the show together...It was a weekend of fun and pure inspiration! While preparing a recent collection of baby quilts, books, fleece hats & such for delivery I was reminded that the Quilt Shop has many groups, students, individuals, designers, teachers, friends, family and neighbors who are very talented and look forward to crafting things that can be put to good use for the needs of others. And many of those have knowledge of not only sewing but crochet and knitting too. Thanks to all this support, this month we sent out a full box that contained 14 quilts paired with books, some crocheted afghans, hats, gloves & scarves to the Christian Appalachian Project (CAP). CAP is an interdenominational, non-profit Christian organization committed to serving people in need in Appalachia. One of which is providing opportunities for children to reach their highest developmental potential by providing physical, spiritual and emotional support. For all who would like to participate in that effort we are accepting donations of handcrafted & store bought (if preferred) of children’s hats, gloves, scarf's, socks, baby quilts & blankets to include books and school supplies. Donations of sewing materials to be used for this purpose will be accepted too. These donations are being accepted on an ongoing basis, and I look forward to seeing the wonderful items you all come up with to meet the needs of these children.